An irreverent attitude shared by Fulco di Verdura and Coco Chanel is the starting point for one of the most iconic designs of all time. Oh sure there are important art historical references and cultural touch points, but it was really the designers shared outlook that got things underway. 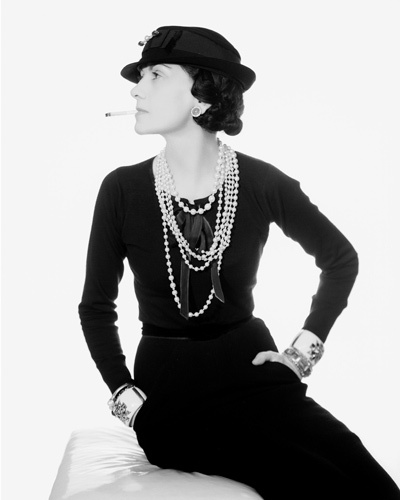 Coco Chanel loved jewelry, but she really didn’t care if her pieces were costume or precious. “A woman should mix fake and real,” she once declared. 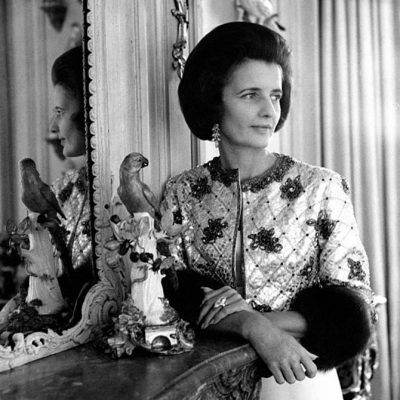 “The point of jewelry isn’t to make a woman look rich but to adorn her—not the same thing.” The designer practiced what she preached always piling on her costume jewelry with the fine jewelry she received from various lovers including the Russian Grand Duke Dmitri and the Duke of Westminster who reputedly gave her a jewel every week with a bouquet of flowers. By 1927 Chanel was 44-years old with a full treasury. It was around this time she met the titled Italian whose full name amounts to Fulco Santostefano della Cerda the Duke of Verdura. According to Verdura’s biographer Patricia Corbett Sicilian nobility were famously indifferent to pecuniary matters. A perfect example of the Duke’s imprudence was the Palermo Ball he threw in 1929 inviting tout le monde and blowing the remains of his inheritance at the tender age of 30. This attitude applied to jewelry meant Verdura was fearless about breaking the rules. It is well established the relationship between the two was close. They went on inspiration trips. Verdura guided Chanel through the Renaissance jewelry at the Treasury of the Munich Residence as well as the collection of Augustus the Strong and Charlemagne in Dresden. They vacationed in Italy and visited the Byzantine mosaic of Empress Theodora in the Basilica of San Vitale in Ravenna. 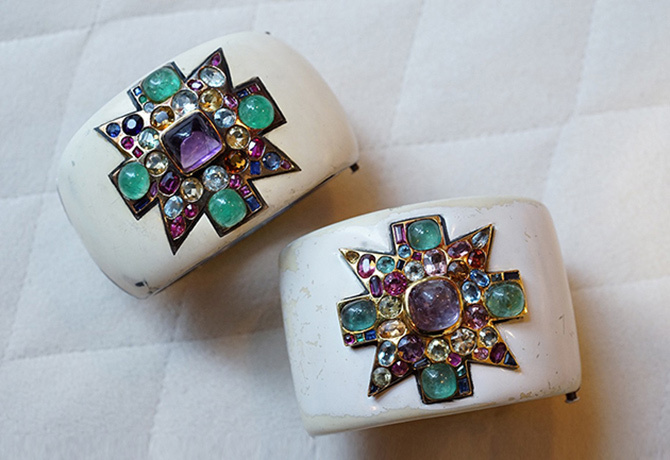 One design outcome of their travels were Fulco’s first Maltese cross designs—a pair of slightly mismatched gold brooches with multi-color semiprecious stones. The collage of gems in the pieces harkens back to jewelry the pair admired during their travels but were unlike anything being created during the 1930s. The Maltese cross shape (sometimes referred to as the Amalfi cross) of the brooches was the jewelry designer’s loose interpretation of the star of the Knights of Malta. Like many of the motifs Verdura used in jewelry, the Maltese cross links back to his childhood growing up in Sicily not far from the Amalfi coast and the Island of Malta, home base for the First Crusades. 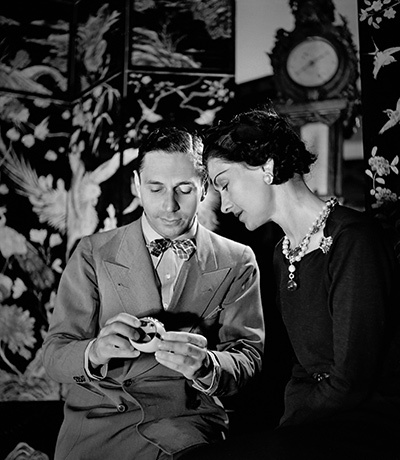 The Maltese cross brooches were gifted to fashion editor extraordinaire Diana Vreeland who was a dear friend of both Chanel and Verdura and one of the people responsible for bringing the pair together. The next Maltese cross jewels Verdura made were a marginally mismatched pair of white enamel bracelets for Chanel’s personal collection. The stone arrangement on each cross is completely unique. In keeping with the design duos blasé attitude about the difference between fine and costume jewels, bracelets were composed of a base silver alloy. Chanel loved the pieces and wore them constantly. They appear on her wrist in formal and casual photos. It would not be an exaggeration to say she wore them with abandon—the white enamel on the jewels is seriously chipped. 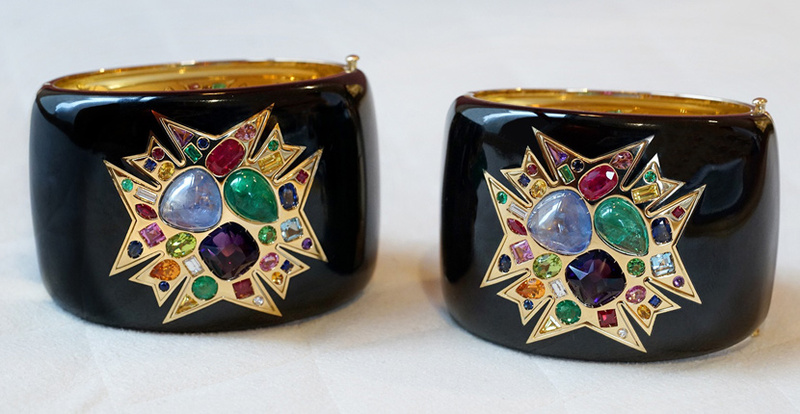 Since the original Maltese Cross Cuffs were created around 1930, Verdura has made any number of variations on the original work. Over the years the artistic soul of the design has remained while the materials have become more refined. The most iconic versions are set on black or white jade cuffs. The most luxurious renditions, the Theodora cuffs were created to celebrate Verdura’s 75th anniversary, since the company opened its doors in New York City in 1939. 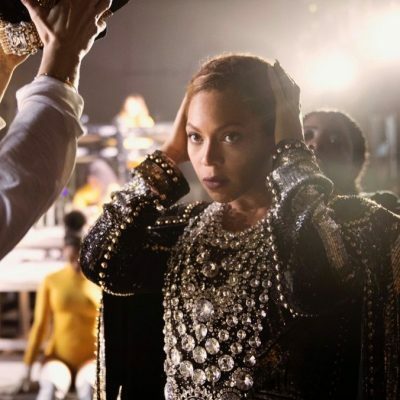 The deluxe limited edition series of 200 black enamel and gold cuffs each have 31 gems including a 9-carat sapphire, a 5-carat emerald and a 5-carat amethyst. Some playful spins on the cuff concepts—Chanel and Verdura would have surely approved—feature unique centerpieces with gemmy designs. “A cuff after all is a great canvas to place a motif,” says Landrigan. Any number of celebrities have been spotted in the Verdura cuffs throughout the years. For the 75th Anniversary exhibition at the New York boutique several loaned their personal pieces to the presentation including Sarah Jessica Parker, Brooke Shields, Whoopi Goldberg and Sofia Coppola. Among all the women Coppola is seen wearing her cuffs most often at casual and formal events. When she was on Vanity Fair’s Best Dressed list in 2006, she said the onyx Verdura cuffs were her favorite jewels.